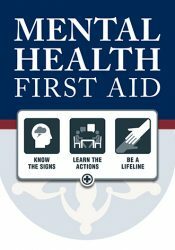 SummitStone Health Partners is helping to bring Mental Health First Aid to Northern Colorado in order to encourage public understanding of the sign and symptoms associated with behavioral health issues. We are proud to offer Mental Health First Aid Colorado courses to help improve participants’ knowledge of behavioral health disorders, reducing the stigma, and increasing the amount of help available for those who may need it. Through our certification course, you’ll become a mental health first aider. We’ll teach you how to respond to someone with a mental health challenge. Challenges that include depression, suicide, substance abuse, psychosis and panic attacks — to name a few. You’ll learn the signs, evidence based actions and how to connect those in crisis to support systems that can help them recover. Class hours: 8:30 a.m to 5:00 p.m. Lunch is provided. Contact Annie Brunsell at annie.brunsell@summitstonehealth.org or (970) 494-4253 with questions. You must register online to reserve your spot. Registration closes one week prior to class date. The Adult Mental Health First Aid course is appropriate for anyone 18 years and older who wants to learn how to help a person who may be experiencing a mental health related crisis or problem. Topics covered include anxiety, depression, psychosis, and addictions. This course is available to all community members as participants come from a variety of backgrounds and play various roles in northern Colorado. All dates/courses subject to change.